Your smile is one of the first things that people notice when they first meet you. Walden Family Dental Care offers SE Calgary Teeth Whitening services to help you achieve your perfect smile. Walden Family Dental Care offers a variety of convenient ways to whiten your smile. The two most popular methods include In-Office and Take-Home Tooth Whitening. 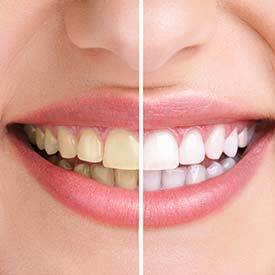 Professional teeth whitening products product dramatic results in little time. In-Office Pola Custom Teeth Whitening is a procedure that we use in our office to whiten your teeth in about one hour. We use concentrated Pola Custom Teeth Whitening gel which is applied to the surface of the teeth, and noticeable results are achieved that day and will continue to improve for up to one week after your appointment. Pola’s unique formula dissolves and releases the active whitening ingredient immediately, releasing the whitening ingredients much faster than conventional whitening options. Pola Custom Teeth Whitening does not require UV light to speed up the process. We also provide our in-office whitening patients with a professional take-home whitening kit in order to fine-tune and enhance their whitening until their desired results are achieved. Spa Dent Professional Take-Home Teeth Whitening kits are a safe, fast, and effective way to remove stubborn stains and discoloration of your teeth in the comfort of your home using professional strength whitening agents. Your supervised take-home whitening treatment effectively whitens the enamel surface of the teeth, unlike drugstore whitening kits. Dr. Angela Sharma and her team will monitor your progress to ensure that any side-effects such as tooth sensitivity are managed quickly. Teeth whitening may not be ideal for every patient and at Walden Family Dental Care we offer many smile makeover options to help you achieve the healthy, youthful, beautiful smile that you dreamed of. Our smile makeovers may involve treatment options such as cosmetic bonding, porcelain veneers, and dental crowns. We know that your smile is important to you — call today to make your appointment for SE Calgary Teeth Whitening at Walden Family Dental Care Clinic! Call us at (403) 460-2200 to book your Teeth Whitening Consultation with us today!